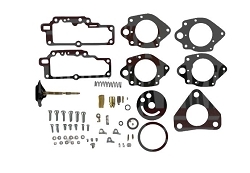 Carter YH, 1 barrel marine carburetor rebuild kit. 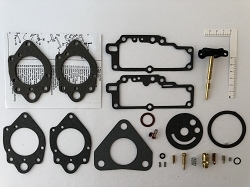 You will need 1 kit for each carburetor. These are new, currently being produced. 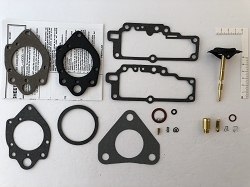 The YH carburetor was also used on the Corvair and Corvettes. Please match your carburetor number with the numbers in the list provided. There will be 3 numbers followed by an S.
Perfect items for out useage. Fast shipping and great packing. Thanks!!! Float Level With gasket removed, bowl cover inverted and float resting on pin in seated needle, the distance from the bowl cover to the top of float should be 9/16". Do not depress float lip against spring loaded pin in needle, but let float rest on its own weight. Adjust by bending float lever. Float Drop With bowl cover assembly held in upright position, the distance between bottom of float (at free end) and bowl cover should be 2 1/8". Adjust by bending stop tab on float arm.